#exstrange is a curatorial project in the form of an artistic intervention into the world of capitalism that seeks to transform eBay into a site of artistic production and cultural exchange. 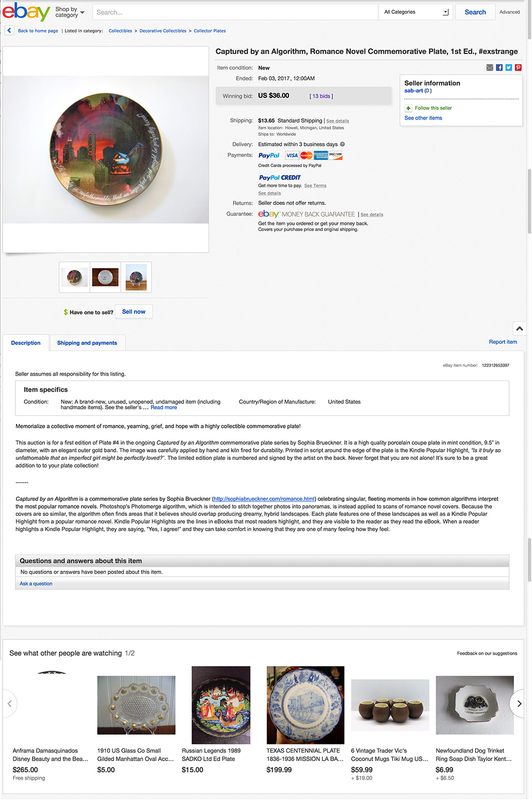 #exstrange uses the online marketplace eBay as a site of curatorial operation, artistic production and cultural exchange within the geographical boundaries enabled by the platform itself. 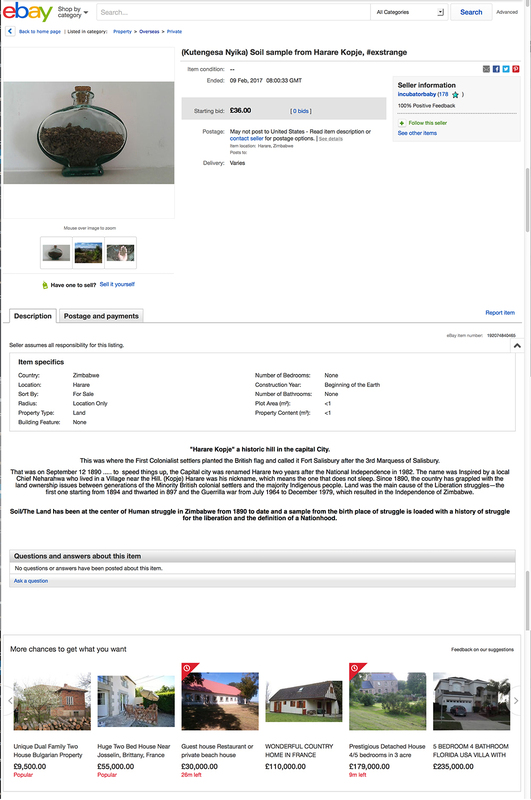 #exstrange is a series of “artworks as auctions” created for eBay, using the entire listing as material. Descriptive text, images, pricing, and categories are tools used to build the artwork. 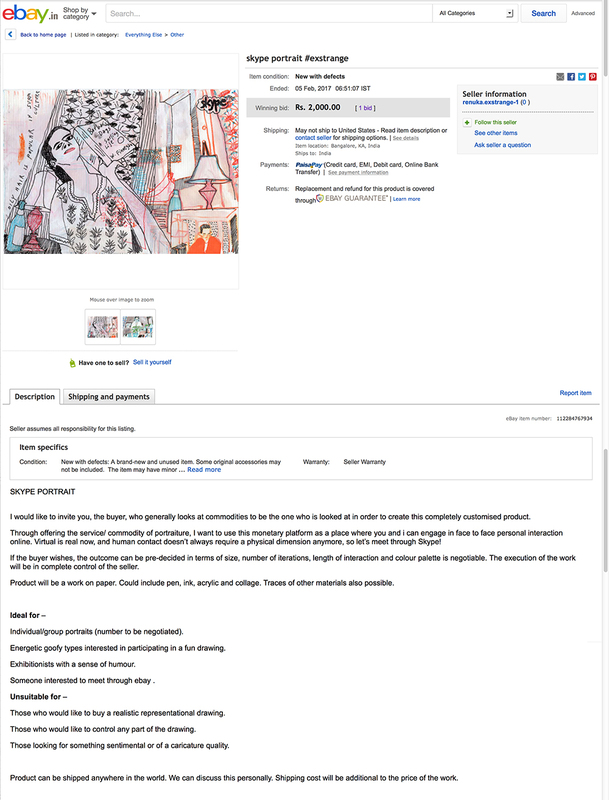 Exhibited on eBay for 7 days, these site-specific artworks are each posted and maintained by their creators so that bidder interactions and comments are incorporated in real time as part of the work. As a live exhibition project, #exstrange utilizes and responds to the specificity of the spaces within the e-commerce service (eBay categories) and explores how to create meaningful encounters between artists and their audiences, and between passers-by and artworks. The curators invite artists, designers and researchers to use this online space to develop new strategies of production and communication. #exstrange began with Ghidini and Modrak’s curatorial invitation to 21 artists to launch a 7-day artwork/auction beginning, sequentially, on January 15, 2017. The next stage of the show starts on February 5, 2017 when guest curators based across the globe invite three artists each to participate in the exhibition. The show, connecting auctions through use of the tag #exstrange in the title, is now expanding in multiple ways, engineered to extend the exhibition beyond the curators’ direct agency. Any artist, designer or eBay account holder may post an auction by using the tag #exstrange and by following the set of instructions posted on the exhibition website. How can contemporary networked e-commerce services be appropriated to create a space for artistic production and engagement? How can the online marketplace be used to promote forms of collaboration, process-based practices, and community interventions that are often marginalized by the art system of galleries, museums and biennales? #exstrange comes from the working title Exchange with Stranger, influenced by Georg Simmel’s understanding of the “stranger,” a role characterized by nearness and remoteness; the stranger enters into a community with the ability to perceive entrenched dynamics with new eyes (Simmel). #exstrange artists and designers will seek out eBay communities clustered around categorical experiences and pose auctions as engagement. #exstrange welcomes serendipitous encounters with exchange-partners from across geographic, cultural and political regions. Unlike the some 3.5 million pieces of traditional art for sale on eBay, the artworks in #exstrange utilize the methods and systems of eBay as elements in their artwork. 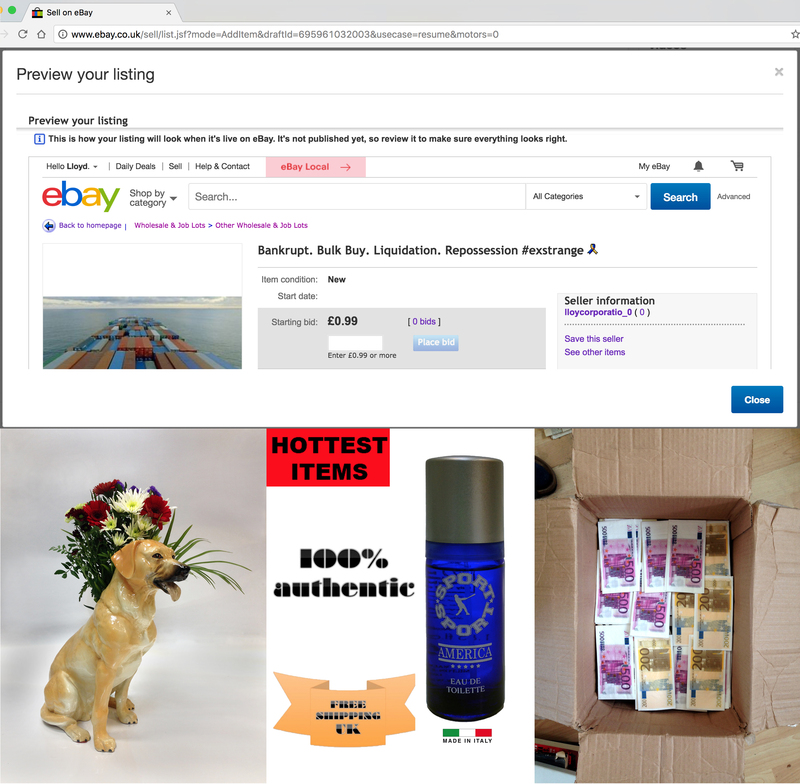 Artists use eBay’s existing categories, such as Real Estate, Healthcare, Agriculture, and Personal Security, as site-specific contexts that ‘host’ particular communities of interest beyond physical barriers. In an #exstrange auction, the entire listing (item for sale, descriptive text, keywords, pricing, imagery, and category placement) comprises the artwork so that the full work exists only within the venue of the online marketplace. 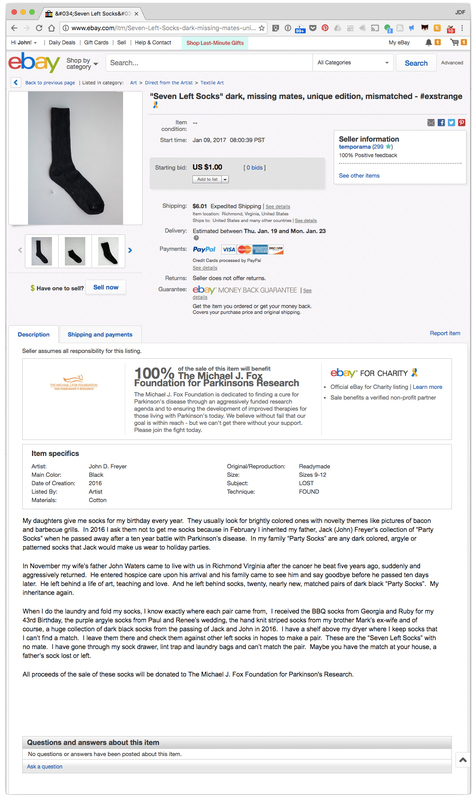 Inspired by participatory democracy and open-source models, this exhibition uses and builds on the pre-existing networks within eBay (such as the communities formed through categories, the rating system for monitoring buyers/sellers, and the comments) to create opportunity for reflection, declaration, questioning, nonsense, analysis, and evocation, expanding the potential for participation. The audience—viewers who seek out the show, potential buyers, and happen-chance browsers—can inquire into ideas proposed through the auctions/artworks by commenting directly on the listing, or by creating and posting their own auction. Serendipitous encounters are significant to our interests in extending art practice outside the confines of the gallery into spaces where ideas and provocative encounters take precedence over the mechanisms involved in formally exhibiting Art. #exstrange is disseminated and supported by a website (http://www.exstrange.com) that offers an interactive mapping of the auctions and listings, the geographical locations of the artworks—the items for sale, their destinations, and exchanges between the artists and their audience. 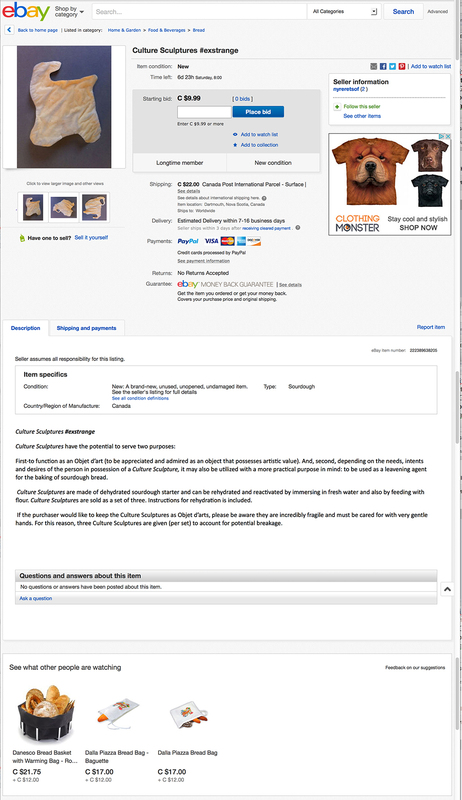 Images and text provide a visible reflection on the exchanges taking place on eBay.com, and hint at the often hidden transactions happening within the art world. A print catalog documents the artworks and exhibition, and contextualizes the show with essays on the relationship between contemporary art and commerce, also taking into consideration the changes brought about by digital technology, and the web as a source of information and a space for exchanges. Olga Goriunova (Goriunova, 8) points to the history of “platform” as an organizational structure for political activity and revolution that emphasizes collective work, and “encourages inclusivity” through setting up alternative systems for sharing resources. Before the advent of the Internet, art groups such as the New York Correspondence School, the International Mail Art Network, the Nouveau Realistes, and Fluxus enacted Goriunova’s idea of platform by taking advantage of communication technologies like the postal system as paths for sharing ideas, activism, and aesthetics. These practices were rooted in life-affirming, utopian principles that aspired to facilitate equitable representation and involvement in all media. #exstrange advances the idealism of this vision by utilizing online commerce as a tool for interconnection, shared interests, social responsibility and exchange. Just as mail art used the postal system as a platform to create a new art world beyond the boundaries of conventional art structures, we see eBay as an economical platform offering artists access to worldwide networking potential. Where mail art inherently involved a degree of privacy in exchanges between individual and individual, #exstrange’s collective action and use of social media encourages open participation and inclusivity, proposing a new direction for “correspondence” work based on the current mass communication system, the Internet. In the early 21st century, the vision of the platform was reconceived through the web interface, which became the space of the encounter between the machine and the human (Ghidini; Andersen and Pold). Curatorial and artistic interventions into established web platforms and services, through playing with the role of the interface, have the potential to disrupt existing systems of value and production of knowledge. 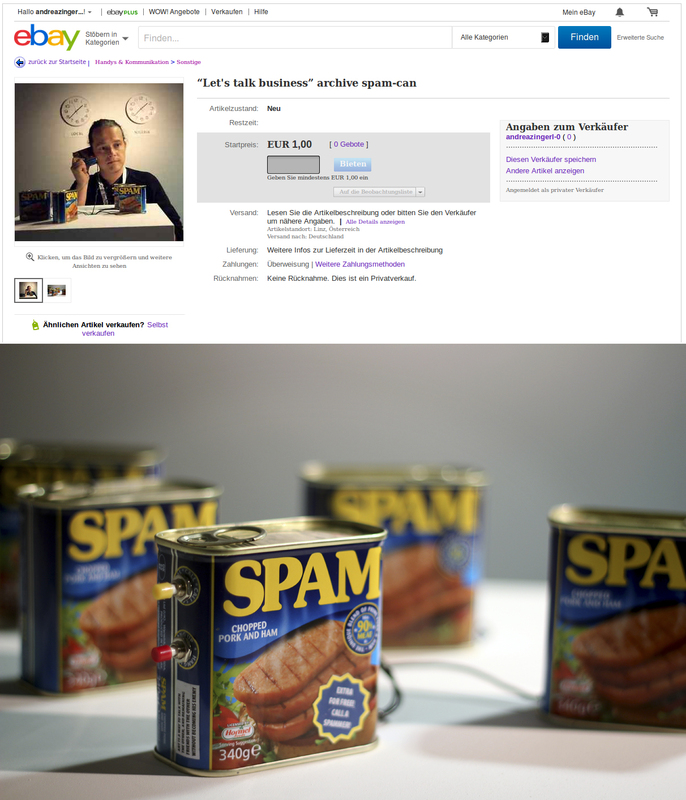 According to Goriunova, online art platforms that adopt the form and format of the database (an archival interface), such as Runme.org (2003) and CuratingYouTube.net (2007), allow for a redefinition of meanings and values through the creation of new taxonomic systems and modes of categorisations triggered by collective action (Goriunova). Through the creation of a system of classification based on categories suggested by members, administrators and users submit artworks to generate a “collective enunciation of software art” (Runme.org). Or, by allowing users to aggregate video material in a grid using the associational classification common in the vernacular of social media platforms, CuratingYouTube.org promotes new forms for fostering “cultural practices.” (Miranda) Rather than creating virtual spaces of objects, or for the display of objects controlled by a curator, these projects focused on forming communities online that, through their behaviours and choices, question established systems of interpretation and understanding. Similarly, #exstrange, by becoming a parasitic extension of a commercial database, generates a new type of encounter between the machine and the human (the online commercial service and the buyer), starting with the very questioning of its system of categories, ratings, and exchange. The transparency and unbound distribution that the internet offered to art practitioners in the early 1990’s, evident in interdisciplinary communities devoted to promoting art practices and discourses of The Thing (1991), Nettime (1995), and irational (1996), has been increasingly disappearing. 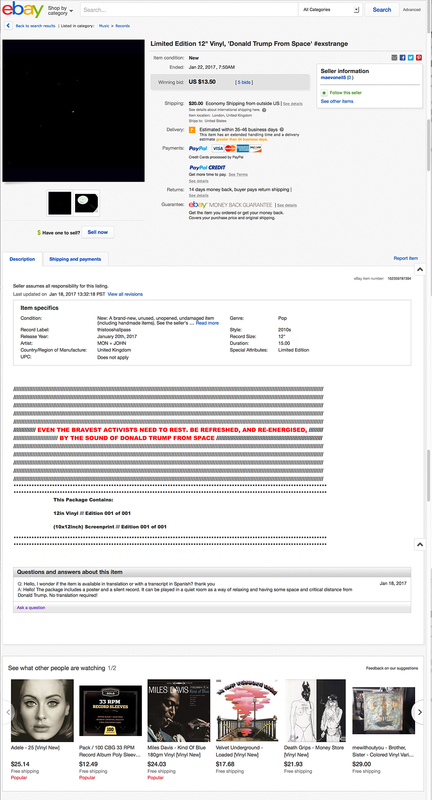 In the 1990s, artists working on the net often played with the rules of the art market by creating websites as if they were a gallery specifically dedicated to net.art such as Olia Lialina’s Art.Teleportacia (1999) or as collaborative platforms based on participation such as Desktop.is by Alexei Shulgin (1998). However, recent models of distribution based on gatekeeping, such as sales and auctions of editionable web-based work, have been created for the Internet to re-propose closed commercial models of the market. 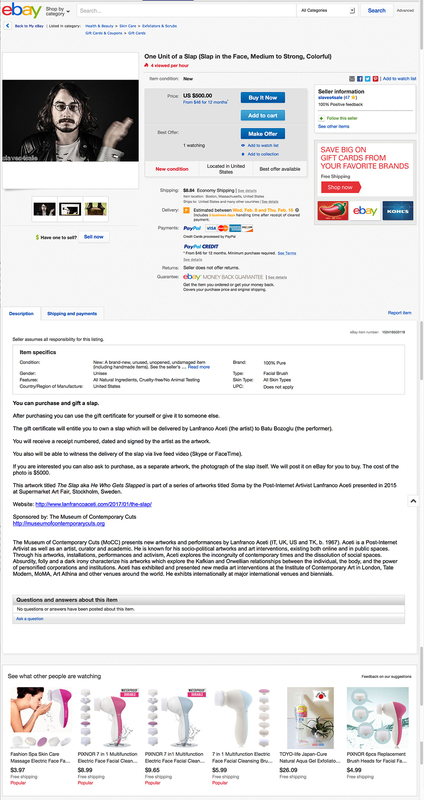 Online auction houses such as Puddle8 (2012) — funded by a consortium of private investment and asset management firms — as well as services for collectors such as s[edition] (2012) do not cultivate new models of circulation and engagement, even if they present themselves as places that “aim to establish the next generation of contemporary artists” or as channels through which “collecting and exchanging art at accessible prices,” respectively. #exstrange aims to challenge the rhetoric of high-end niche luxury culture by taking inspiration from the strategies that Howard Becker identified in “maverick” artists (Becker, 1982), that is, the conscious rejection of conventional organization and practices of the art world in order to assert creative freedom, independent of market forces. With #exstrange, the curators hope to give life to an “alternative exhibition configuration” (Lichty, 2002) that will supersede the mode of the production of culture proposed by the museum, a mode “determined by oligarchic hegemony issuing forth from centers of capitalist, academic, and political power” which enforces a “’top-down’ approach to culture.” The project aims to achieve this by giving up full “curatorial control.” By setting up a system that is self-generative (Cox and Krysa, 2000), #exstrange extends the legacy of projects like the above-mentioned Runme.org (2003) but also of Surf Clubs (collaborative artist-run blogs responding to contemporary digital culture and vernacular), such as Nasty Nets (2006). Further, #exstrange taps into the infrastructure of the commercial web, allowing the curators to investigate the contemporary cultural moment related to a neoliberal commercial system through exchanges — geographical and personal — between the seller/buyer, artist/viewer, and trickster/reviewer. The documentation of such exchanges, unavailable on many other web-based practices such as Surf Clubs, provides research for future practitioners and scholars. “The studio for the cultural jammer is the world at large” (Negativland). 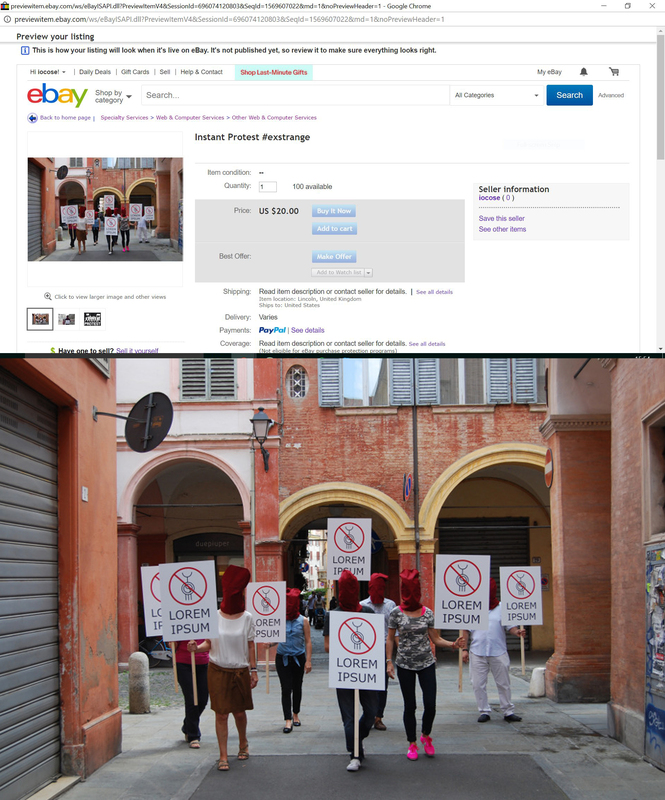 Handelman and Kozinets (2004) described culture jamming as “an organized, social activist effort to counter the bombardment of consumption-oriented messages in the media.” The project #exstrange exerts a spirit of self-determination into the consumer cultural industry of eBay. We see #exstrange as a vehicle operating in the lineage of Negativland’s definition of “culture jamming,” as an interventionist activity that lays bare the fixedness of eBay’s original commercial strategy by supplanting those imperatives with new rationales. #exstrange fosters play within the confines of marketing strategy; play is an alternative form of critique and generates diverse modes of practice. #exstrange views the vast spaces of eBay as a playground of collective engagement, allowing each participant to direct us to a specific site,–say, Medical Supplies, for their action. As a web-based practice, #exstrange has the potential to bring together people not based in the same community, to transcend spatial geography, and to subvert cultural hierarchy. As a stowaway on a platform designed for commerce, #exstrange redirects the exchange from one of simple capital to one of cultural capital, through the flow of ideas and paradigms, and in place of goods and currency. #exstrange is funded by the Center for South Asian Studies and the Stamps School of Art & Design, both at the University of Michigan. Rebekah Modrak is an artist and writer. She is the creator of Re Made Co., which uses recreation to parody the rhetoric around designer tools and the appropriation of working class identities, and the author of “Bougie Crap,” which analyzes the links between design, education, corporate culture and the appropriation of symbols of Detroit. She is Associate Professor in the Stamps School of Art & Design at the University of Michigan. Banet-Weiser, Sarah, and Marita Sturken. “The Politics of Commerce: Shepard Fairey and the New Cultural Entrepreneurship.” In Blowing up the Brand: Critical Perspectives on Promotional Culture, edited by M. Aronczyk, and D. Powers, 263-284. New York: Peter Lang, 2010. Bazzichelli, Tatiana and Geoff Cox, editors. Disrupting Business: Art and Activism in Times of Financial Crises. New York: Autonomedia, 2013. Becker, H. S. Art worlds. Berkeley: University of California, 1982. Bourriaud, Nicolas. Relational Aesthetics , trans. Simon Pleasance and Fronza Woods with the participation of Mathieu Copeland (Dijon: Les Presses du réel, 2002). Ghidini, Marialaura. Curating Web-based Art Exhibitions: mapping online and offline formats of display. PhD: University of Sunderland, 2015. Goriunova, Olga. Art Platforms and Cultural Production on the Internet. New York: Routledge, 2012. Lichty, Patrick. “Reconfiguring the Museum: Electronic Media and Emergent Curatorial Models.” SJSU/CADRE Institute’s SWITCH Journal, February (2002). http://switch.sjsu.edu/nextswitch/switch_engine/front/front.php?artc=72. Miranda, Maria. Unsitely Aesthetics: uncertain practices in contemporary art. Berlin: Errant Bodies, 2013. Negativland, Over the Edge Vo. 1: Jamcon ‘84, Label: Seeland, 1984. Paul, Christiane. “Flexible Contexts, Democratic Filtering, and Computer Aided Curating – Models for Online Curatorial Practice.” In Curating Immateriality: The Work of the Curator in the Age of Network Systems, edited by J. Krysa, 85-105. New York: Autonomedia Press, 2006. Simmel, Georg. On Individuality and Social Forms. Edited by Donald N. Levine. Chicago: The University of Chicago Press, 1971. Welch, Chuck. Eternal Network : A Mail Art Anthology. Calgary: University of Calgary Press, 1995. IOCOSE, “Instant Protest #exstrange,” 2017, eBay auction originating in Lincoln, UK, Courtesy of IOCOSE. Lloyd Corporation, “Bankrupt. Bulk Buy. Liquidation. Repossession. #exstrange,” 2017, eBay auction originating in London, UK, Courtesy of Lloyd Corporation. John D. Freyer, “Seven Left Socks. dark, missing mates, unique edition, mismatched – #exstrange,” 2017, eBay auction originating in Richmond, VA, USA, Courtesy of John D. Freyer. Objects are containers for stories, from the cherished family heirloom passed down from generation to generation to the humble pair of “party socks” left in the top draw of my father’s dresser, in his home in the Villages. My father’s life was reduced to a collection of objects with no purpose, which no longer really fit anyone, in style or in shape. This summer I helped my mother sort through huge black garbage bags of my father’s clothing. I remembered him wearing a particular shirt or sweater and put it asides. I saved all of the Syracuse University sports gear that he had, thinking my brothers would want something from the pile. In the end four and a half bags of clothing went to the thrift store, stripped of their history, freed from the burdens of memory, to be used, repurposed or discarded by future owners with their own set of stories. 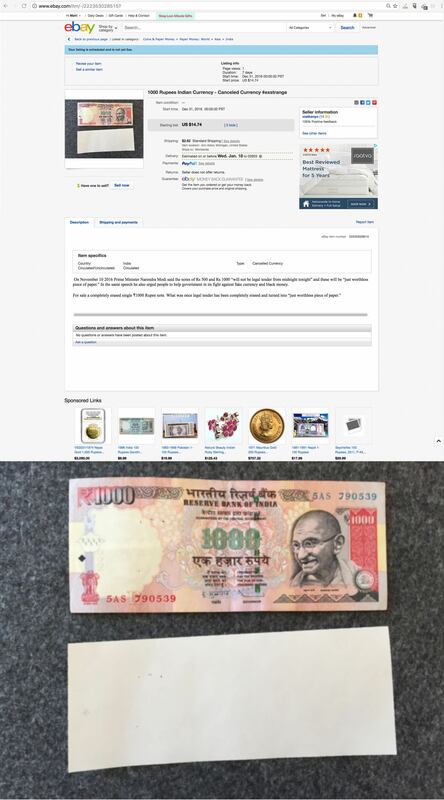 Matt Kenyon, “1000 Rupees Indian Currency – Canceled Currency #exstrange,” 2017, eBay auction originating in Providence, RI, USA, Courtesy of Matt Kenyon. KairUs, “Let’s talk business. archive spam-cam #exstrange,” 2017, eBay auction originating in Austria, Courtesy of KairUs. Sophia Brueckner, “Captured by an Algorithm, Romance Novel Commemorative Plate, 1st Edition #exstrange,” 2017, eBay auction originating in Ann Arbor, Michigan, USA, Courtesy of Sophia Brueckner. Curators: Rebekah Modrak + Marialaura Ghidini. Captured by an Algorithm is a commemorative plate series celebrating singular, fleeting moments in how common algorithms interpret the most popular romance novels. Photoshop’s Photomerge algorithm, which is intended to stitch together photos into panoramas, is instead applied to scans of romance novel covers. Because the covers are so similar, the algorithm often finds areas that it believes should overlap producing dreamy, hybrid landscapes. Each plate features one of these landscapes as well as a Kindle Popular Highlight from a popular romance novel. Kindle Popular Highlights are the lines in eBooks that most readers highlight, and they are visible to the reader as they read the eBook. When a reader highlights a Kindle Popular Highlight, they are saying, “Yes, I agree!” and they can take comfort in knowing that they are one of many feeling how they feel. Renuka Rajiv, “Skype Portrait #exstrange,” 2017, eBay auction originating in Bangalore, India, Courtesy of Renuka Rajiv. Curators: Rebekah Modrak + Marialaura Ghidini. The internet is a place where entire friendships/ relationships have materialized and developed. Some of these have never required meeting in so-called REAL life. I would like to explore the possibility of a buyer and seller meeting online, instead of remaining invisible to one another as often happens. I am interested in using Skype because it is now seen as a legitimate form of contact, because of the amount of time virtual interactions now occupy in peoples’ lives. Portraiture comes in many forms but in my interest in it is dependent on participatory involvement and non-fictional performance. Lanfranco Aceti, “One Unit of a Slap (Slap in the Face, Medium to Strong, Colorful) #exstrange,” 2017, eBay auction originating in Boston, Massachusetts, USA, Courtesy of Lanfranco Aceti. Curator: Artist Joiner. 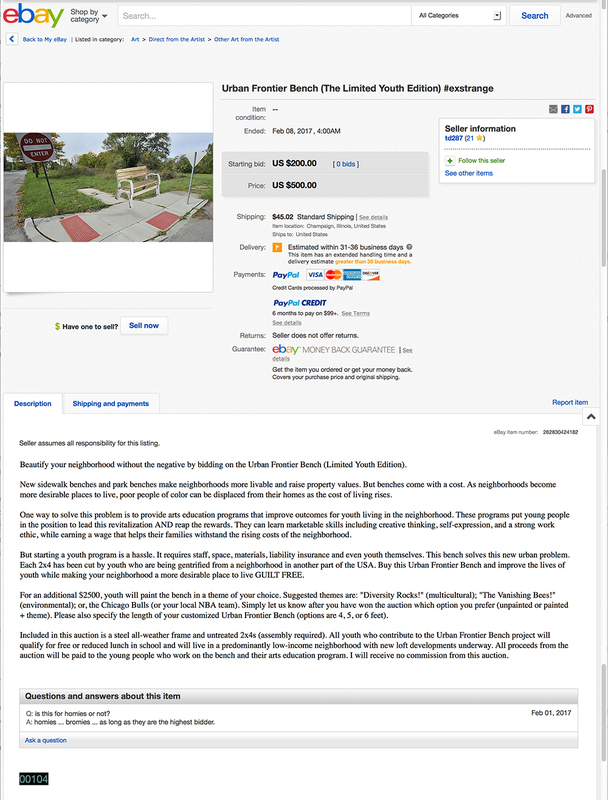 Tyler Denmead, “Urban Frontier Bench (The Limited Youth Edition) #exstrange,” 2017, eBay auction originating in Champaign, Illinois, USA, Courtesy of Tyler Denmead. Curators: Rebekah Modrak + Marialaura Ghidini. 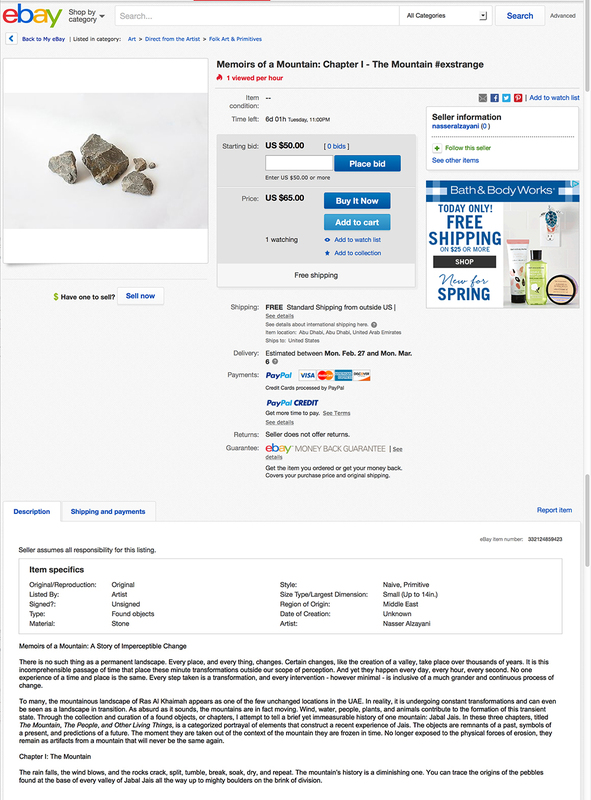 Masimba Hwati, “(Kutengesa Nyika) Soil Sample from Harare Kopje #exstrange,” 2017, eBay auction originating in Harare, Zimbabwe. Courtesy of Masimba Hwati. Curators: Rebekah Modrak + Marialaura Ghidini. Sarah Schönfeld, “Flying Sorcerer #exstrange,” 2017, eBay auction originating in Berlin, Germany. Courtesy of Sarah Schönfeld. Curator: João Laia. The work of Sarah Ancelle Schönfeld jestingly deals with the spiritual and scientific imagination. It reflects on different kinds of knowledge-, control- and truth-production, constituting and reproducing our human „self“ in the world. Her method is an appropriation and recomposing of concepts. In order to create new meanings and perspectives, common structures are sliced up, analysed and put back together in a different way, using oracular technics and alchemical experiments. Approaches from various fields find themselves included in her practice, like amerindian perspectisvism, natural science, religion, archeology, mythology, magic and technology. The work includes a wide range of mediums like photography, print, slupture, installation and performance. Maeve O Neill, “Limited Edition 12” Vinyl, Donald Trump from Space #exstrange,” 2017, eBay auction originating in London, UK. Courtesy of Maeve O Neill. Curator: Nora O Murchú. 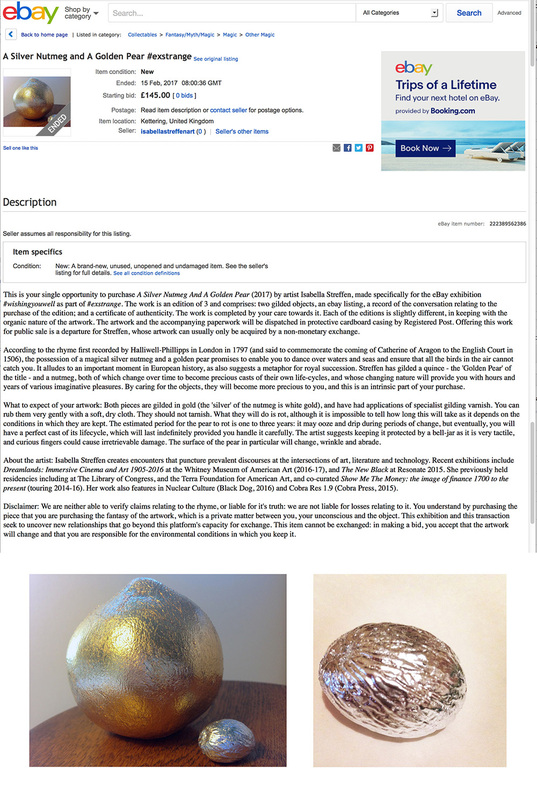 Isabella Streffen, “A Silver Nutmeg and a Golden Pear #exstrange,” 2017, eBay auction originating in London, UK. Courtesy of Isabella Streffen. Curator: Nora O Murchú. Nasser Alzayani, “Memoirs of a Mountain: Chapter I – The Mountain #exstrange,” 2017, eBay auction originating in Abu Dhabi, United Arab Emirates. Courtesy of Nasser Alzayani. Curator: Latifa Al Khalifa. Nasser Alzayabi attempts to tell a brief yet immeasurable history of one mountain: Jabal Jais. In these three chapters, titled The Mountain, The People, and Other Living Things, is a categorized portrayal of elements that construct a recent experience of Jais. The objects are remnants of a past, symbols of a present, and predictions of a future. The moment they are taken out of the context of the mountain they are frozen in time. No longer exposed to the physical forces of erosion, they remain as artifacts from a mountain that will never be the same again.